Product prices and availability are accurate as of 2019-04-23 11:06:07 EDT and are subject to change. Any price and availability information displayed on http://www.amazon.com/ at the time of purchase will apply to the purchase of this product. ➤ DIAMONDS ARE FOREVER - but so is plastic! Plastic pollution can unfavourably affect lands, waterways, oceans and pose a dangerous threat to living organisms. 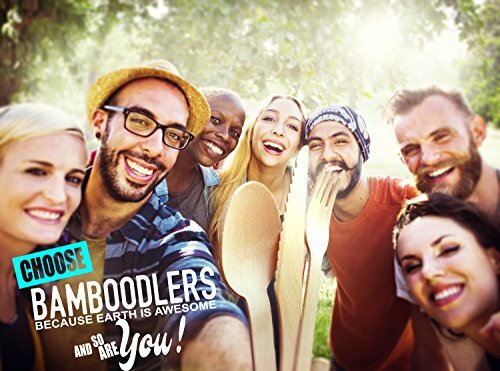 Use Bamboodlers to help protect the Earth from plastic pollution and preserve its awesomeness for generations to come. ➤ PACK IT, USE IT, LEAVE IT! 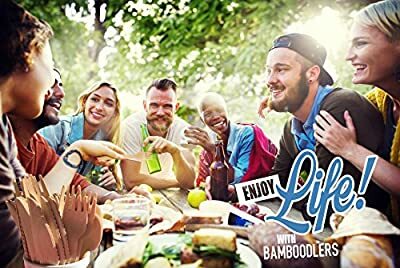 - although we strongly condemn littering, with Bamboodlers, you will have peace of mind on those days when you leave behind your disposable utensils. Because unlike plastic, Bamboodlers will eventually decompose and become food for Earth's other awesome creatures. ➤ BAMBOODLERIFFIC! - okay, so you're not a tree hugger, but Bamboodlers LOOK-SO-FREAKINGLY-AWESOME! Seriously. Look at them! ➤ BE THE FIRST! - Sooner or later everyone will throw an awesome party with Bamboodlers, those cool wooden utensils that they saw for the first time from a cool friend's party. That could be you! ➤ BE GREEN, BE "IN!" - Fortunately there is still hope for humanity because nowadays it's cool to be right. 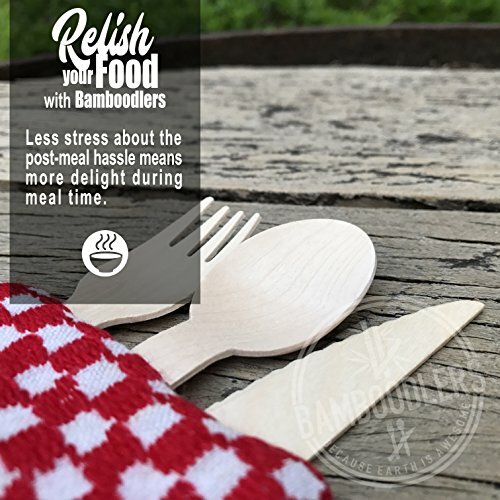 So complete the package by using Bamboodlers on your next food trip. ★ 100% NATURAL! 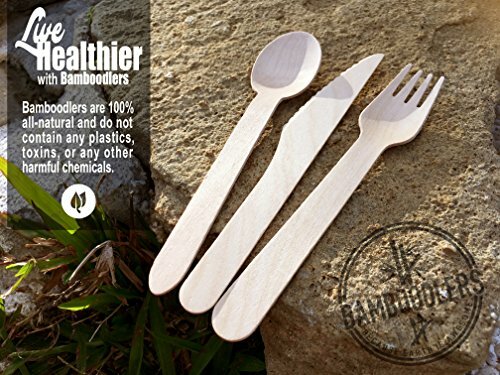 - Bamboodlers Disposable Wooden Cutlery are a great alternative to its Bamboo counterpart. They are made from 100% all natural Birchwood. Like Bamboo, Birchwood is Eco-Friendly, non-toxic, and sturdy but at a fraction of the price. ★ FSC CERTIFIED! 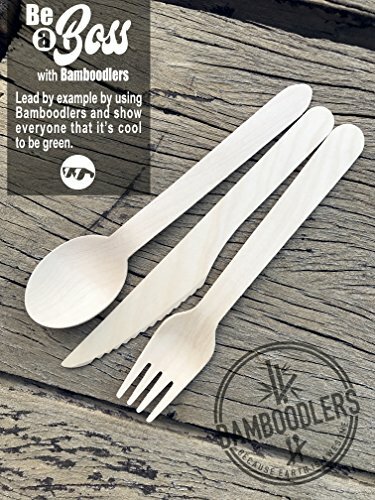 - All Bamboodlers are sourced exclusively from Forest Stewardship Council certified forestry operations, adhering to strict forestry guidelines. 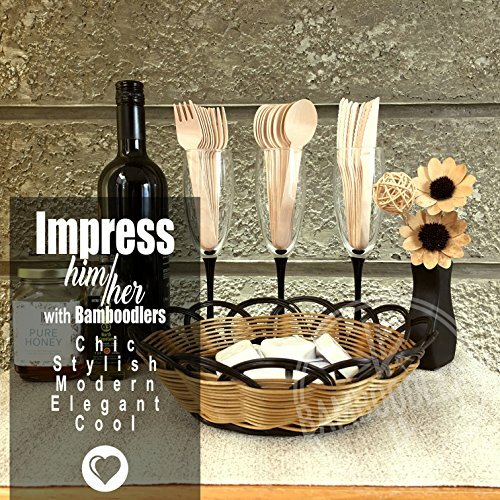 You can rest assured that with Bamboodlers, you are not harming the Earth with irresponsible forestry.